The 509 even comes with a RGB logo that’s powered by a 4-pin connector (compatible with motherboards with RGB headers).This provides 509 users with an incredible visual experience. There are three multifunctional brackets placed on the right side of the 509, near the front, which are not only supportive for 2.5" SSDs, but also accommodating of 120mm fans. The versatile bracket design will make your PC building experience easy and enjoyable. Distinctively, the 509 is equipped with graphics card support brackets, which prevents the motherboard PCI-E slots from being distorted and the graphics card from malfunctioning. Generally, slot distortion is caused by interfering oversized graphics cards. But with the special brackets, your graphics card will work smoothly. 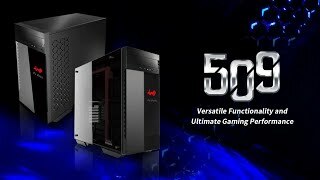 The 509 full tower chassis’s roomy interior supports: E-ATX, ATX, Micro-ATX and Mini-ITX motherboards. These motherboard options allow gamers to have more options when choosing their gaming hardware. In terms of the cooling installation, the 509’s interior structure is extremely flexible. The front side supports a maximum of three 120mm fans, and a 360mm radiator simultaneously. Moreover, the side and the middle of the chassis also supports 360mm radiators and fans.The unique design of the hexagonal, honeycomb mesh exhausts the generated heat from the chassis, optimizing excellent cooling performance. - External Drive Bays: 1 x 5.25"
- Internal Drive Bays: 5 x 2.5"/3.5" - 3 x EZ-Swap, 4 x 2.5"
- Product Dimension (H x W x D): 527mm x 235mm x 578mm, 20.7" x 9.3" x 22.8"
- Package Dimension (H x W x D): 670mm x 635mm x 355mm, 26.4" x 25" x 14"
More links for "509 Design Full Tower Tempered Glass Case - Black/Grey"